Is there anything more exasperating than a proud parent? 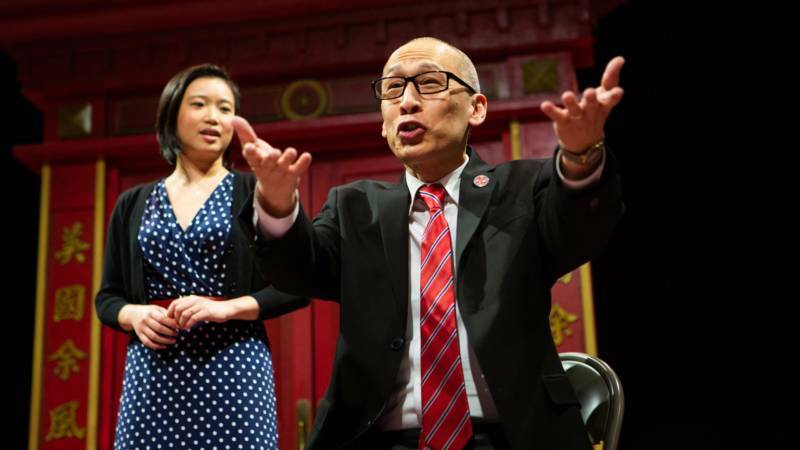 In Lauren Yee’s King of the Yees—a meta-theatrical mashup of family dynamics, Chinatown power plays, and model ancestors—Lauren’s father Larry Yee takes his moment in the spotlight and runs with it to the farthest extreme, all while extolling the talents of his ambivalent daughter, who hadn’t invited him in the first place. But there Lauren's dad is anyway, bearing a giant poster of her face, along with another poster of politician Leland Yee (no relation) for whom he's been a longtime volunteer. As a longtime member of the Yee Fung Toy Family Association, an “obsolescent family association” on Waverly Street, Larry is obsessed with all things Yee. So much so that he’s invaded the stage of his daughter’s play to talk about them. For Lauren, certain truths are unalienable. Her father, the “super volunteer,” is being used by Leland Yee; Chinatown is a dump; she might not have children. For Larry, “being used” is synonymous with “being useful”; Chinatown is a community rich with nuance and history; the Yee line is 36 generations strong and should not be allowed to die out. The more the father and daughter talk over each other, the more distance they establish between themselves, even as their mutual fondness seeps through. But before they resolve their differences of opinion, a new crisis emerges. State Senator Leland Yee has been arrested on charges of corruption, and Larry has already been name-checked on the four o’clock news as a key supporter. With an ominous rumble of Mikhail Fiksel’s sound design and a flicker of Wen-Ling Liao’s lighting, Larry exits the stage, and the chase is on. Under Joshua Kahan Brody’s direction, the first act displays definite lags in pace (though no more than what one can expect anytime a playwright’s proud papa commandeers the stage with voter registration forms and a wealth of historical anecdotes). 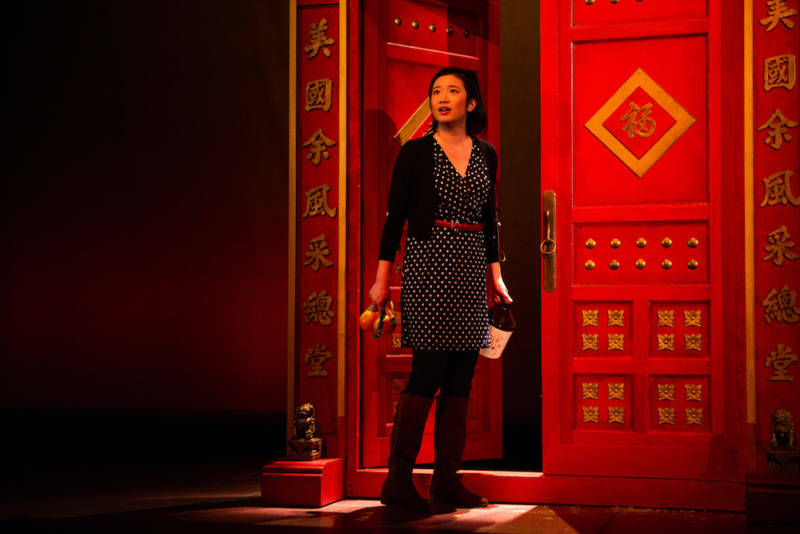 But by the second act, the production settles into an almost extravagant groove, as Lauren embarks on a hero’s quest to find her father through the alleyways and storefronts of Chinatown. Along the way, she encounters the outrageously-attired racketeer Raymond “Shrimp Boy” Chow (Jomar Tagatac), the enigmatic “elders of Lum” who hang out in Portsmouth Square and subsist on fortune cookies, and a shopkeeper who has a stash of “good, cheap” whiskey that Lauren must convince to give her for free. There are lion dancers who boogie to Michael Jackson, FBI agents who dirty-dance their way to oblivion, and a “model” ancestor in heels (Will Dao) who speaks with the flamboyant patter of a queen gunning for a spot on RuPaul’s Drag Race. Shifting characters quickly, Apostal, Tagatac, and Dao make the stage seem as crowded as Stockton Street on a weekend. And the family bond between Jue and Piamonte is so skillfully interpreted, you’ll find yourself rooting for them to find each other again, no matter what the cost. 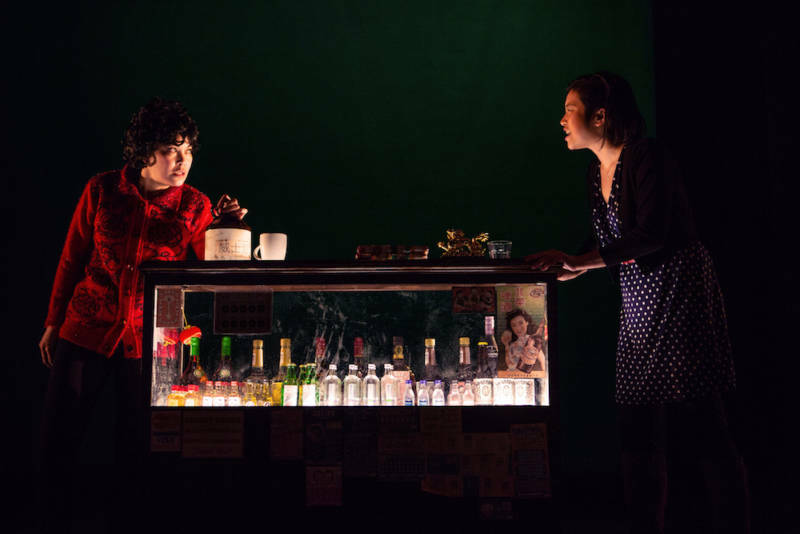 Ratcheting up the stakes with creative staging (actors wandering out into the middle of the audience, a luridly-lit slo-mo fight scene, a Bill English-designed Chinatown doorway with a mind of its own), the cast and crew create an energetically absurd spectacle that still grabs hard at the heart. 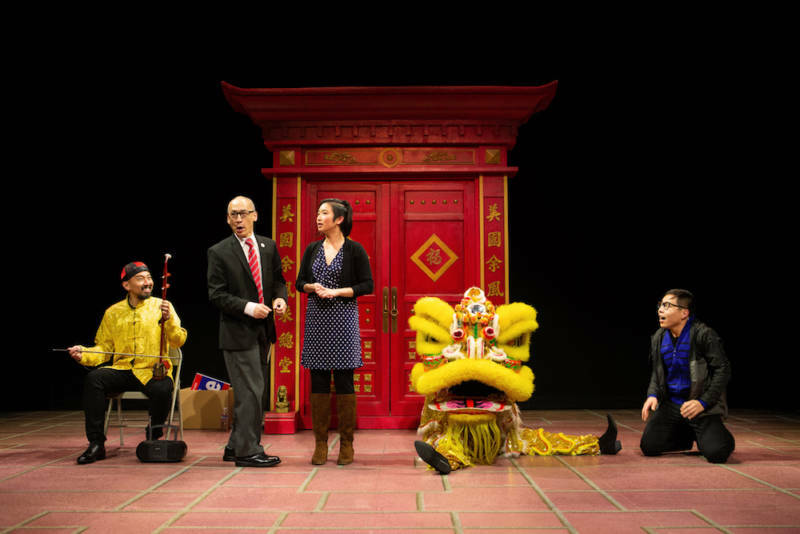 For Lauren Yee, her desire to detach herself from the Yees of Chinatown by creating a play about them has forced her instead to examine her heritage from the inside out. It may smack at times of a self-conscious attempt to justify her own path away from the Chinatown of her San Francisco childhood. But it also evinces her need to build a bridge between her family’s ambitions for her and her dreams for herself. Above all, even at its weirdest, King of the Yees feels like a true labor of love on Lauren's part, and a genuine desire to crown her father—the irrepressible Larry Yee—king for a day. 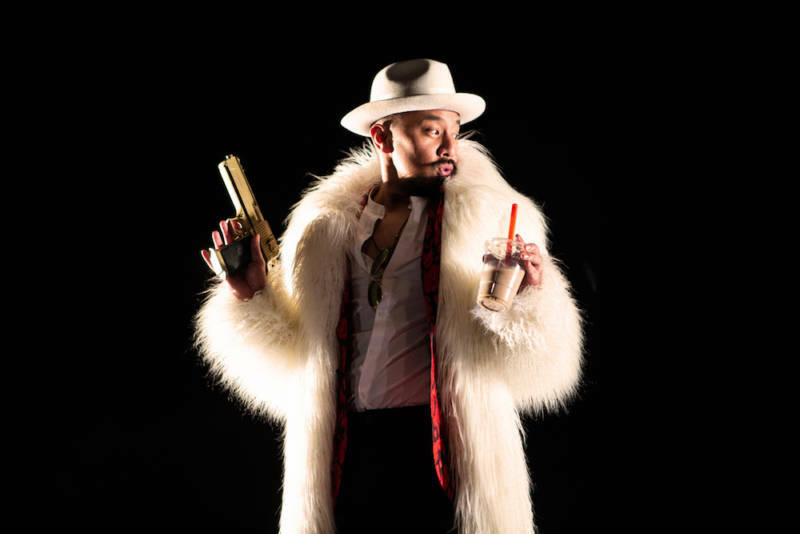 'King of the Yees' runs through Saturday, March 2, at San Francisco Playhouse. Details here.